Join the MTS Software Solutions team at The Hyatt Regency Dallas for MBA's Technology Solutions Conference and Expo 2019. This annual conference is the mortgage industry's premier tradeshow focusing on today's technology solutions. Attend to connect with leading mortgage technology experts and vendors, strategize for the future and learn about the latest technologies to help you grow your business. MTS Software Solutions invites you to stop by Booth #316 to learn more about automation technology for the mortgage industry and how we're helping lenders to turn more loans in less time with fewer resources. Founded in 1981 and headquartered in Moorestown, New Jersey, MTS Software Solutions Inc. provides technology and services that simplify, streamline, and accelerate document and data-driven business processes. 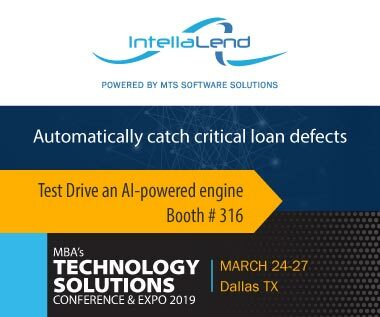 The company's automated loan quality control and auditing technology, IntellaLend, helps mortgage lenders effortless import and classify loan files and automatically extract and validate data, enabling faster loan decisions.